2019 Earlybird Rates out now! Queenstown is one of New Zealand’s most breathtaking destinations. It is always buzzing with year round activities such as jet boating, sky diving and bungee jumping as well as the world class winter activities such as skiing and heli skiing. Queenstown is a perfect destination for singles, couples, families, groups of friends and work getaways. There is pleanty to do for both the avid skier or snowboarder, as well as the non skier. Queenstown itself is a year round town offering an abundance of shopping, restaurants, nightlife and adventure activities. Queenstown is host to some of the most stunning landscape in New Zealand. The town overlooks Lake Wakatipu and the town is surrounded by towering mountains including the ski resorts Coronet Peak and The Remarkables. Queenstown is guaranteed to take your breath away as you wake up to the sun breaking over the lake and mountains and in the evening as the sunset lights up the mountains in glorious colours. Queenstown is located in the South Island of New Zealand. It is 55 minutes drive from Wanaka, 3.5 hours drive from Dunedin, and about 6 hours drive from Christchurch. Queenstown has the convenience of flying directly in to the town, with most accommodations only a 10 minute shuttle from the airport. Flying into Queenstown can be quite expensive and often it is recommended to compare prices flying into Dunedin and Christchurch. There is limited transportation between the Christchurch and Queenstown and Dunedin and Queenstown, therefore it is recommended to hire a car. Queenstown accommodation varies and there are options to suit everyone. There are Queenstown hostels and basic Queenstown studios for the single or budget traveller. There are Queenstown Hotels ranging from 2 star to 5 star for couples or friends who are looking to mostly eat out. There are Queenstown Apartments ranging from 2 star to 5 star for couples, families and groups who want the option of full kitchens and separate living areas. Location in Queenstown is very important. If you do not have a car, there are shuttles to get you around town and most Queenstown accommodation is only a short walk from the center of Queenstown. Skiing in Queenstown is the most popular winter activity. Queenstown offers an abundance of options for New Zealand Skiing. Coronet Peak Ski Resort is located about 20 minute drive from Queenstown. The Remarkables Ski Resort is located about 45 minute drive from Queenstown. Cardrona Ski Resort is located about 1hr drive from Queenstown. Treble Cone Ski Resort is located about 1.5hrs drive from Queenstown. Many Queenstown hotels are within a short walk from the Queenstown center. It is not recommended to drive into the center of town as parking is very limited and is mostly metered. There is a local shuttle around Queenstown which picks up and drops off from most hotels. There is a small charge for the local shuttle bus. Queenstown does offer transfers from most Queenstown hotels to Coronet Peak Si Resort, The Remarkables Ski Resort, Cardrona Ski Resort and Treble Cone Ski Resort on a daily basis. These can be pre booked for guaranteed seating. Queenstown offers a huge amount of non ski activities. 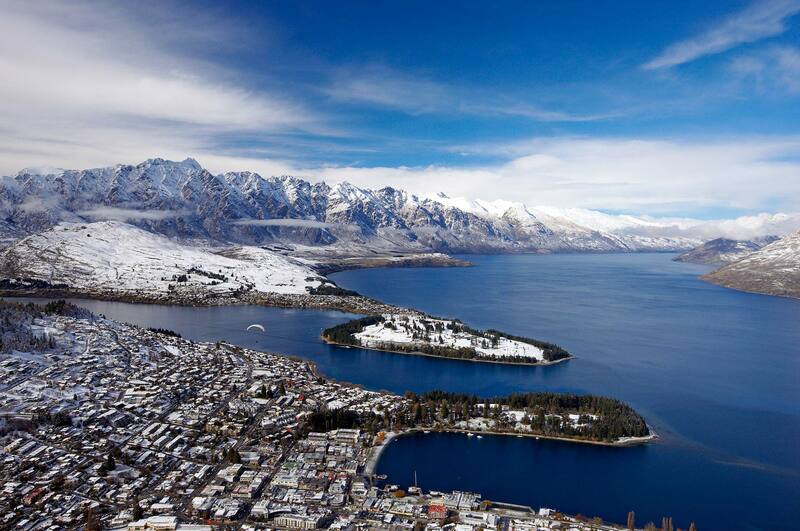 Queenstown is known as the adventure capital of the world. Jetboating, ski diving, bungee jumping, heli skiing, luge rides and rafting. However for those who are looking for a activities at a slower pace, there is an abundance of shopping, dining, hiking, bike riding, as well as many day tours to the Otago wineries, Milford Sound, Doubtful Sound, Te Anau Glow Worm Caves and much more. There is always so much happening in Queenstown. July is host to the Queenstown Winter festival. To see what else is on in Queenstown, click the what’s on tab.